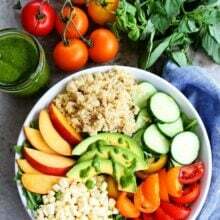 Summer Quinoa Bowl-this simple and healthy quinoa bowl is filled with all of your favorite summer ingredients! There are too many good things to eat during the summer months. Every time I go to the farmers market, I come home with several bags of fresh produce. When I unload my farmers market finds, I get giddy with excitement. I want to eat everything at once. 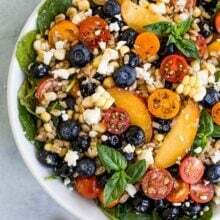 My answer to eating all of the delicious summer produce at once is this Summer Quinoa Bowl. It has all of my favorite summer ingredients! 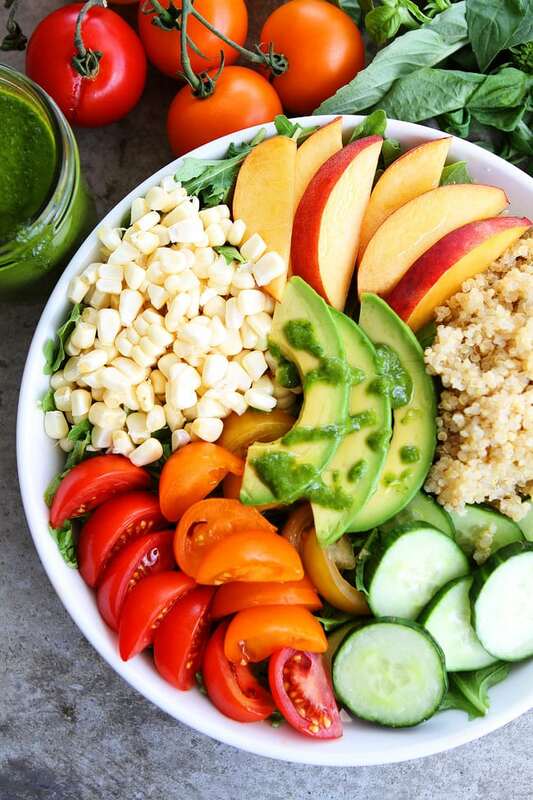 So what is in my magical Summer Quinoa Bowl? I start with a bed of greens. I am on an arugula kick right now, but any greens will work. Kale, spinach, romaine, mixed greens are also good options. Next, I add cooked quinoa, peaches, sweet corn, tomatoes, cucumbers, avocado, and my favorite basil vinaigrette. You can use any salad dressing, but I highly recommend my basil vinaigrette. 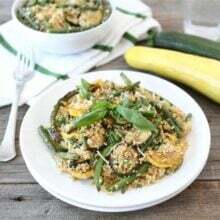 It is the BEST and a great way to use up the summer basil. 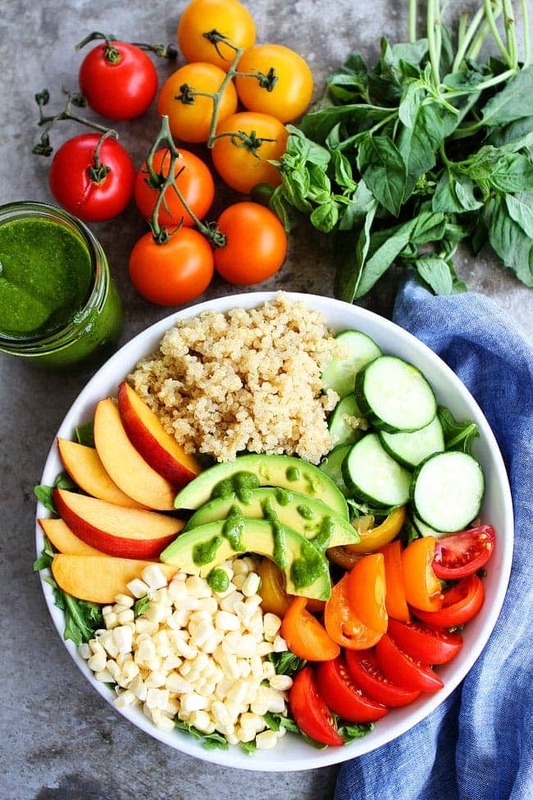 Look at that gorgeous bowl, it screams summer! It is great for lunch or dinner. I seriously could eat it every single day of the summer, and I just might. It is colorful, healthy, and soooooooo delicious! 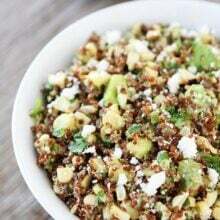 Use your farmers market or garden goods to make this Summer Quinoa Bowl. You can enjoy all of your summer favorites in ONE bowl! 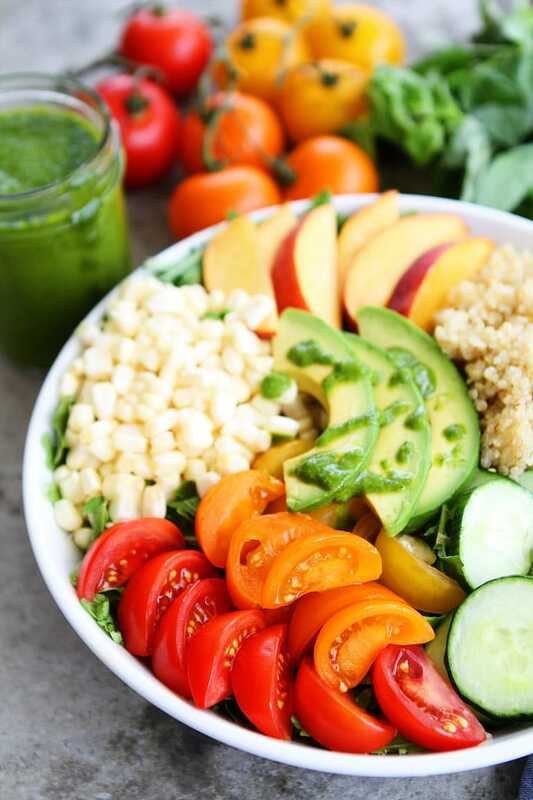 This is easy quinoa bowl is filled with all of my favorite summer ingredients! It is great for lunch or dinner! Place the arugula or greens in a medium bowl. 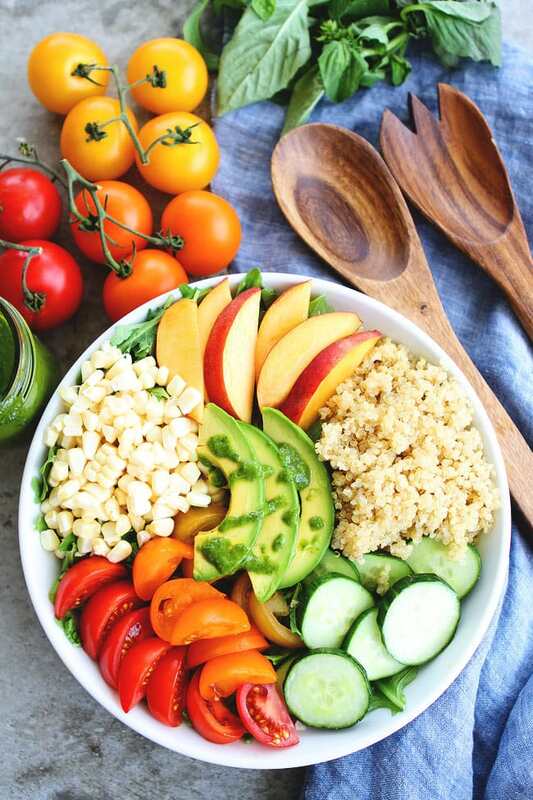 Top with the quinoa, peaches, corn, tomatoes, cucumber, and avocado. Drizzle with basil vinaigrette and season with salt and pepper, to taste. Serve immediately. Note-you won't use all of the basil vinaigrette for one bowl. Store leftover vinaigrette in a jar in the refrigerator for up to 5 days. 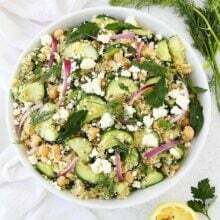 When I cook the quinoa, I always cook extra so I can make the salad all week. Love all of the colourful fresh summer ingredients! This is absolutely gorgeous, Maria! Hey girl this looks so yummy! I need to start going to our farmer’s market here in town! This is one gorgeous dish! I want this for lunch! What a great looking salad. Would make a fab packed lunch too! What a gorgeous bowl, Maria! I made this last night and it was SO good! I didn’t have a ripe peach so I used a nectarine and I added feta cheese. It hit the spot and the vinaigrette was so yummy and easy to make! Love quick and easy meals like this in the summer.